Cusco is one of Peru’s top holiday destinations, thanks to its proximity to Machu Picchu and its own vast array of attractions. Andean Trails’ owner Kathy Jarvis has been visiting Cusco for more than two decades, while Fiona Cameron lived in the bubbly and bustling Inca city for more than 12 years. Here we share these experts’ Top 10 of things to do in Cusco – all without a sniff of Machu Picchu. (There are in fact 12 and we could easily have written 20). Head to Chicha restaurant, home to Gaston, the Peruvian super-chef earning international plaudits. We recommend booking in advance. Caviidae? That’ll be a guinea pig then (a rodent not a pig, and from The Andes, not Guinea). And called Cuy – or Cuyo – in South America. Confused? No matter. Head to Tipon town, just outside Cusco, the best and most traditional place if you want to bite into these pets/treats. Locals fight for the eyes – the tastiest part. Learn everything there is to know about chocolate in a hands-on experience at the Choco Museo on Garcilaso 210 (tel: (050) 244 765). 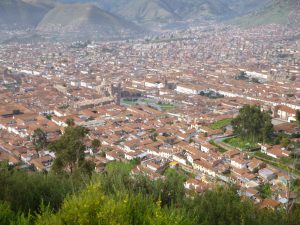 Wander through the San Blas streets to San Cristobal for superb views over Cusco. See the mummies at the Inca Museo, just off the Plaza de Armas. One of Peru’s least-visited but best museums. Walk or horse ride to the Devil’s Balcony, known locally as Chacan, just above Sacsayhuaman, 2.5 km outside Cusco. A natural rock bridge crosses a gorge, with a large cavern beneath. Sacsayhuaman is a great spot to fly a kite, too. Explore the huge variety of local produce in the local markets: flowers, un-nameable fruit, delicious fresh juices and large chunks of meat at San Pedro Market, shop until you drop at the Artisan markets or head (by taxi) to Molino, a huge covered market selling clothes, music, cameras and just about everything you can think of (except fresh food and crafts). Enjoy a post-trek relaxing massage at Yin Yan, Calle Triunfo 392. Down-hill bicycle ride at Yuncaypata, book with a local biking company. Play darts at the Cross Keys pub. Swimming at high altitude is only for the well acclimatized. Get to the Colisea Cerrado early morning and it’s almost empty, perfect for a swim. Lake Huacarpay, 35km/45 minutes south of Cusco on the Sicuani road. Then visit the nearby village of Lucre, famous for its traditional desserts and the excellent restaurant Quinta Lucre, set in large gardens with good local food.